When a project is opened, you can click on the top-left button on the toolbar to access the project manager. L The project manager shows the structure of your entire game. You can fold and unfold each category by clicking on the small arrow next to each category. Game settings: this is where you can customize the global settings of the game. For example, the default size of the game window or the package name for Android and iOS. You can also set the icons for your game. Scenes: Scenes are the different screens and levels in your game. Everything in GDevelop is created in scenes. External events: To make the development of your game more flexible, you can create events inside separate sheets of events, that are not linked to a particular scene. They are called external events. You can then link to these “External events” whenever you need them. If you need to use a collection of events often, and in different places, you can make them external and call them from your scenes rather than adding the same events multiple times. External layouts: Similar to external events, you can create levels or often reused part of levels inside external layouts and then load them into your scenes. Functions/Extensions: Extend GDevelop and make your events more modular by creating new actions, conditions and expressions, using events! Read more about functions to learn how to create them, use them in your game and share them. 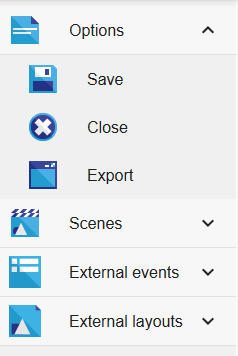 In the desktop version, the File menu allows you to save your game, open another one or close it. You can also export your game. 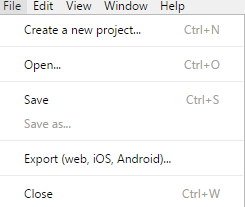 In the web app, these options are at the top of the project manager.